Pneumatic Cylinder Operated Open Body Fabricated Design Pinch Valve, Gujarat, India. Available in double-acting, fail-open or fail-closed configurations, these valves can also be fitted with pneumatic or electric actuators and pneumatic or electro-pneumatic position controllers. A wide range of elastomers are available to suit most service conditions. CAST IRON, CAST STEEL – WCB, STAINLESS STEEL, ALLUMINIUM. 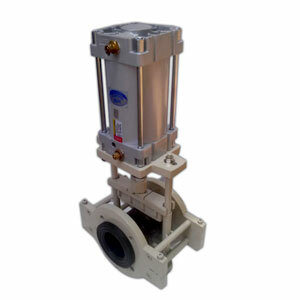 Pinch Valve is a completely enclosed, actuated control valve. Its reliable, maintenance-free design is suited for tough slurries, abrasives, corrosive chemical applications, effluent unit. Shreyas pneumatic Control Pinch Valve is a long-lasting, flexible rubber sleeve, available in a wide variety of elastomers suitable for any application. With its excellent control characteristics, these valves can be used as a throttling control valve. Open Body Fabricated Pneumatic Cylinder Operated Pinch Valve features are simple, lightweight, which allows for easy visual verification of sleeve position.